Most of you on this distribution list are thought leaders and successful professionals. You enjoy the spotlight and are comfortable on the podium. You’ve done countless presentations to groups large and small and chance are you’ve got it down to a science. But what about AFTER you’ve wowed the live audience with your presentation? Maybe you printed out handouts in advance or asked attendees to email you for a copy of the presentation. Some will. 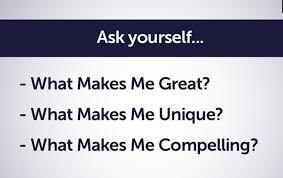 Many won’t and that’s just part of the reason why your great thought leadership content is left to die on the vine. Whether it’s a presentation, a white paper or a chapter of your new book, you want to share your smarts with as many clients, prospects and centers of influence as possible. SlideShare (acquired by LinkedIn in 2012) is one of the best ways to do that. It’s also a great tool for getting yourself found by thousands of well-connected people who don’t know you yet—but who should. In its simplest form, SlideShare is like YouTube for professional presentations (not cat videos) and can easily accommodate PowerPoint, PDF, Keynote or OpenDocument presentations. Like YouTube, there are featured presentations and you can search the vast archive of presentations by keyword or topic–and the archive it is VAST. The sharing site gets an estimate 70 million unique visitors per month and an estimated 400,000 new presentations are uploaded daily. Unlike YouTube, SlideShare gives you quality eyeballs, rather than quantity. SlideShare is a favorite hunting ground for journalists, speaker bureaus and conference organizers. They know if you’re on SlideShare then (a) You’re in the know, (b) You’re probably a thought leader and (c) you know how to put a compelling presentation together. They can see the quality of your work before they book you or interview you and they don’t have to worry about your ability to deliver respectable presentation materials on time for their event. NOTE: Our blog and website has more about this and related topics. Convenience: When it comes time to share your presentations or other long form content, it’s much easier to send a SlideShare link than is to push a memory-hogging 70-side presentation through your email server. 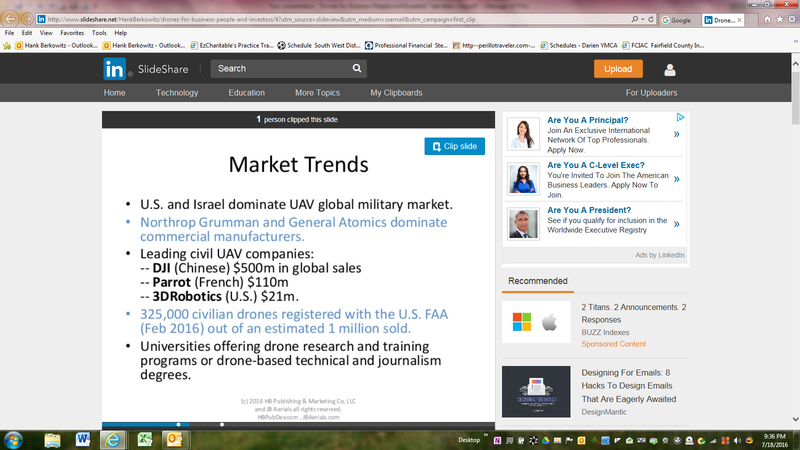 For example, here’s a recent presentation that my son Jake and I did about Drones for Business People & Investors. With all the animations and embedded videos, it would have taken quite a while to send this to you via email, but it’s a snap to send, view and clip via SlideShare. Analytics: We received almost 100 views in the first few days after posting the presentation and most were not people who attended live. In addition to the number and source of views, the basics analytics package tells you the number of clicks, likes, shares, comments, downloads, embeds and lead forms completed. Clipping: This relatively new feature allows users to clip and save the best slides they discover from throughout the SlideShare universe into handy topic-specific clipboards. You can share your clipboard with others and if you’re a presenter, you’ll receive a notification when someone clips one of your slides (and which slide it was). IMPORTANT: Always have your company name and contact info on EVERY single slide or page of the content you upload to SlideShare. You never know you’ll be clipping you or checking you out. Next week, we’ll share more tip about leveraging SlideShare to your advantage. It’s a simple, yet powerful way to expand your reach exponentially—but you want to make sure you do it the right way.